The Delta 10 in. 36-6010 is an easy to use jobsite table saw manufactured in Taiwan. The user’s safety was taken into consideration when this portable saw was designed because it is one of the safest saws you can find in the market today. While safety is of importance, Delta also made sure that the 36-6010’s cutting performance is top notch. It is equipped with a one-of-a-kind tubular frame that gives the saw maximum support and stability. Its sturdy aluminum table, on the other hand, is fitted with a table extension that makes precision cutting possible. This portable tool is fitted with a large ON/OFF switch, a blade that is easy to clean since it retracts below the aluminum table top, and an anti-friction table coating. It has a speed of 5000 RPM, a blade tilt, and Dado capacity. Can you use a dado blade? You can use a dado blade with this saw and can get about ¾ inch stack onto it. You will likely run out of arbor after that. You may want to find a dado blade set that will fit this saw. What makes the 36-6010 different from the 36-6020? Delta’s 36-6020 has a moveable stand while the 36-6010 does not have one. The stand allows users to clean up faster since it is foldable and easy to store. The 36-6020 has a one-piece framework that ensures the saw is always in place. Does the 36-6010 come with the saw blade? This portable saw comes with a 10-inch saw blade, an all-purpose blade that you can use for your woodcutting and construction needs. It has carbide teeth for ripping. Do I need to order the dado set separately? Yes you do. It is also advisable to get a blade for finer cuts. Is there a locking mechanism for the saw? Yes there is a locking mechanism to ensure that the saw is in place when you are cutting. This table saw can be a bit pricey but if you are a Do-It-Yourself enthusiast looking for a reliable contractor-grade saw, this portable power tool is definitely a good buy. At 62.9 pounds, it is lightweight and can be brought just about anywhere. You can move it from your workshop to another area if needed. Everything you need are stored under the tabletop itself. The blade guards, miter gauge, push stick, and kick back cleats can be stored right under the table making it easy for you to transport this piece of machinery and its accessories in one go. However, even with all the positive details mentioned above, its performance is still the most important reason why the portable tool is worth a look. It can handle a range of construction and woodworking tasks with ease. You’d find that it is easy to use and can perform basic and complicated construction cutting with your safety in mind. The important components of the saw are made from metal and this particular model also comes with an all-purpose 10″ blade. Admittedly, there is still room for improvement. The manual needs work for example but other than that and a few changes that need to be done with the sawdust shoot, this portable power tool is a must-have. The Delta 36-6010 can take on difficult cutting tasks thanks to its impressive stability, the power of its motor, and its overall design. Minor assembly is needed but if you’re good at following instructions, putting this power tool together would take less than an hour. Opening the box would give you 14 parts that need to be put together and they come with 11 smaller bags of bolts and nuts. Equipped with an easy to access ON/OFF switch, Delta made sure that this machine represents the brand’s adherence to safety standards. It operates with ease and you can easily see that the brand made sure that accuracy is their top priority because of the precise cuts that the Delta 36-6010 makes. One of the best things about this power tool is everything is in place. As mentioned in the general description, your push stick, blade guard, and the like have their own storage areas right under the table. This makes it very easy to move and to pack if you are planning to work outside of the workshop. The cord has its proper place too and it is stored securely when you’re moving this piece of machinery. This table saw is also equipped with a rear extension table giving users more room for their materials. This is definitely a well-thought-out feature by Delta because it makes working with this machine more convenient especially if you are handling longer and heavier pieces. The durable aluminum top is also a plus. The saw has a maximum cutting depth of 3 ½ inches at 90 degrees and 2 ½ inches at 45 degrees. It also has a safety feature that prevents the miter gauge from being displaced when in use. Added safety features include the front and rear locks on the fence. Maintenance is fairly easy when it comes to this saw since the blade and all other parts are very easy to clean. Proper maintenance and cleaning is still required though. You will need protective grease to ensure that your saw is safe from rust. All accessories are onboard and you don’t need an extra box to carry them because they have their proper places right on the power tool. Additional accessories such as a dado blade set can be bought with this portable saw. Anyone who handles power tools either as a Do-It-Yourself enthusiast or as a professional contractor can rely on the Delta 10 Inch 36-6010 Portable Table Saw for their cutting and ripping needs. This portable tool has impressive reliability and support and can withstand everyday use. 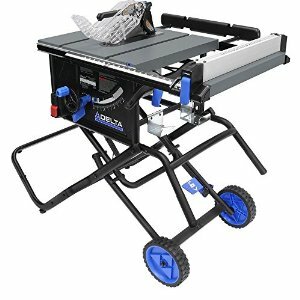 If you have a workshop and love working on construction projects or do so professionally, this table saw is right for you. This power tool from Delta is a great piece of machinery for users who have to work with longer and heavier materials. If you do not have much experience with table saws, you shouldn’t worry because this simple portable tool is fairly easy to use. Beginners will find joy in using and experimenting with this tool. There is a wide range of users who bought this power tool from Delta and many of them are men and women ages 30 and above. This means that the 36-6010 is a great choice for any DIY user or contractor of any gender. This table saw’s fence guard is difficult to put in place. If you are having a hard time with the assembly, make sure that you call for technical help to ensure that all safety features are working properly. If you come across an issue with the extension table’s locking mechanism, there is a possibility that it was not assembled the right way too. Based on these two experiences, it is fair to say that assembly can be a bit of a problem. The bolts and nuts and other parts are not properly labeled as well making this more difficult. There are only a few pieces to assemble but it can get confusing. The manual adds to the difficulty with the assembly as well because it is lacking at best. Delta has to improve the manual to make it less of a task to put the power tool together. The sawdust shoot also needs some improvement but this concern is not much of a problem. The price is not very attractive either. It costs more than other table saws in the market. It would be nice if the price tag is a lot lower than it is now. How does this saw compare to other table saws? Delta’s 36-6010 is a commercial grade power tool with a 15 amp motor fitted with heavy duty bearings that can take on tough tasks on a daily basis. While other table saws can buckle from heavy use, this power tool from Delta won’t and it even has a 5-year warranty to ensure that you will be using it for many years. The Bosch 4100-09, although more popular than the Delta 36-6010, does not have an aluminum table top and its blade does not retract below the table top like the Delta power tool. It also has an easy access ON/OFF switch right on the side of the saw. It is also a serious competitor to the Makita 2705 and the Dewalt 7491rs. DIY enthusiasts who have bought and worked with this saw are all in agreement that it is a good portable tool worth its price. It is quiet, gives precise cuts, easy to roll around if you buy it with the stand, and a reliable machine for your construction needs. Adding in the 5-year warranty from Delta makes it more attractive to those who want a new table saw. This table saw has gotten quite a number of positive reviews with most users raving about its performance. Many describe it as an excellent machine that has become a reliable construction companion. The motor runs great too, according to others who have used it but that there is room for improvement when it comes to some of the screws and other smaller parts. Some screws come lose because of the motor’s power and it is advised that you make sure that all screws are in place when you start using the saw. The Delta 10 in. 36-6010 Portable Table Saw is a great option for those who want an easy to use and easy to clean saw that offers enough support for the construction tasks that need to be done. Although it is admittedly pricier, this reliable machine will have you cutting and ripping for years to come.